This chapter posits sensory tours as a method for discovering children’s embodied “storied entanglements” in, with, and for the natural world (Ritchie, 2014, p. 50). Drawing from existential forms of phenomenology (Merleau-Ponty, Phenomenology of perception (C. Smith, Trans.). Routledge, New York. (Original work published in 1945), 1945/2002), and recognizing the significance of somesthetic experiences (Iared et al., 2016), sensory tours provide a novel approach for understanding children’s experiences of being and becoming and relating with other natural beings. During a sensory tour, a child is invited to wear a small wearable video camera; the camera goes where a child goes, sees what a child sees, hears what a child hears, shows what a child touches, and reveals what a child tastes. Informed by the tradition of walking tours, which have been used for some time in place and environmental education research (Hart, 1979), the sensory tour method is uniquely positioned to unravel embodied temporal-spatial meanings during children’s exploratory movements. This method opens up possibilities for bridging the “correspondence” gap between being and thought – by capturing children’s pre-reflective movement – their imaginative song and dance, self-talk, and expressive utterances, as they interact with and relate to others in the more-than-human living world. The chapter will draw from research findings involving young children in an Alaskan cultural and wilderness context (including trudging through tundra, transforming sticks into weapons, and scaling up tree castles). Through these examples, I will reveal how children’s first imaginary and sensory encounters inform their sense of being with the natural world. 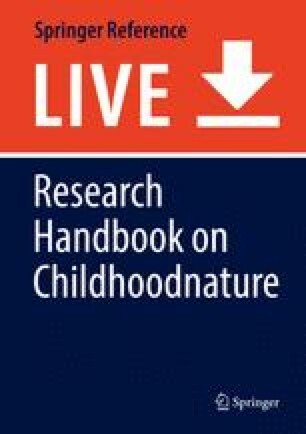 The examples included in this chapter were derived from findings from two research projects: Exploring Methods for Engaging Young Children as Active Researchers and Children’s Environmental Identity Development in an Alaskan Native Rural Context. These projects were supported by funding from the University of Alaska Fairbanks URSA program and Alaska EPSCoR NSF award #OIA-1208927 and the state of Alaska. Forman, G. (1999). Instant video revisiting: The video camera as a “tool of the mind” for young children. Early Childhood Research and Practice, 1(1). Retrieved from http://ecrp.uiuc.edu/v1n2/forman.html.